In a time of economic uncertainty (or any time for that matter), it would be nice to find an investment where you can double your money. What if I told you this investment also has extra side benefits of making you healthier and fitter? Ready to sign up? The investment I’m talking about is a garden. The home garden has lost its popularity since the Victory Gardens in World Wars I and II, but with increasing food prices we’re seeing a new-found appreciation for the humble home garden. Growing your own food gives you a sense of accomplishment, gets you outside and off the couch, provides you with fresh and healthy food, and can save you a good chunk of money all at the same time. So How Can a Garden Double My Money? J.D. Roth at Get Rich Slowly has been tracking all of his and his wife’s work, expenses, and produce in their garden since the beginning of this year. 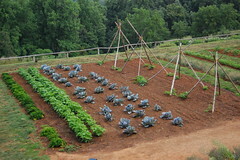 You can read the background of this project and find all of his monthly gardening updates here. In his October update, J.D. realized he and his wife have roughly doubled their financial investment in their garden this year. J.D. even admits they haven’t been conducting this as a formal experiment to see just how much they could save by having a garden. He and his wife have been hobby gardening for quite some time and have their own (admittedly non-frugal) ways of doing things. 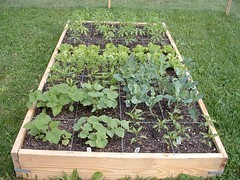 If you set out to have a frugal garden, I would venture to say you could easily triple your financial investment. If you’ve never gardened before, I highly recommend you start small. This past year I started my own small garden using Square Foot Gardening techniques as taught by Mel Bartholomew. You can find out more on the Square Foot Gardening website or by borrowing the Square Foot Gardening book from your local library. I had a lot of fun with this project, and it was fairly easy. The hardest part was setting up my boxes, but I had the benefit of very few weeds all summer long. You can get a good amount of produce (for 1 person) with as little space as 4′ x 8′. If you don’t have much space at all (apartment-dwellers), then you can look into container gardening. Trust me, you’ll enjoy your efforts when you’re pulling off fresh tomatoes in the summer! Now is a great time to start reading up and planning for next spring. You can find plenty of free information online and at your library. So dig in and get ready to double or triple your money!